Dear blog, I seem to have gone into total crafty overdrive recently. I'm not sure what's going on but, somewhere between being pregnant again and having a few reclusive days off work, I seem to have rediscovered my creative mojo and have barely restrained myself from compulsive making. I'm using this post to share a pair of Nordic style mittens that I made for Thing 1, and a couple of little hat designs that I've been working on for Thing 2 (the girlbot who's still cooking in the oven). First up - here are the mittens. These were made at speed during such a cold week in January that I really wanted to get them finished and onto my son's fingers as soon as possible. I used a pattern that I found on ravelry that forced me to pay close attention to charts for a few days. The main challenge was that the pattern is charted for a light background whereas I was working with a dark background, hence I constantly wanted to knit white when I should have been knitting grey and vice versa. In the end I had to print a negative copy of the chart, just for my own sanity! Moving onto Thing 2, if there is one certainty in this yet-to-be-seen life, it is that she will never be short of hats. Not only will she inherit a stash of hats that I made for Thing 1, but I can't seem to stop making and designing new ones for her. 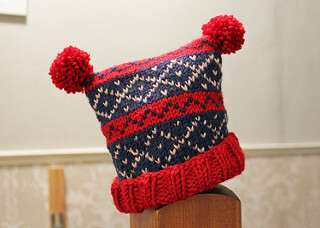 First up is this simple little fair isle hat, which is a variation on a hat I designed for the boybot when he was in my tum. (His was stripey). At some point I'll put this pattern up on ravelry as a variation of the free pattern that's already there. 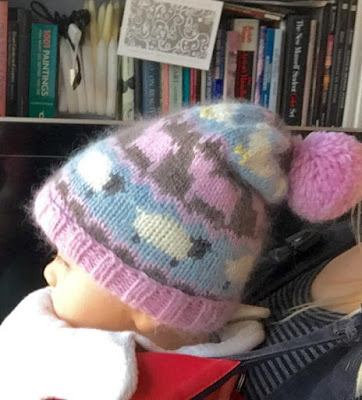 I've popped back and edited this to show the hat on baby's head! Still haven't got round to writing up and sharing the chart. Tsk!